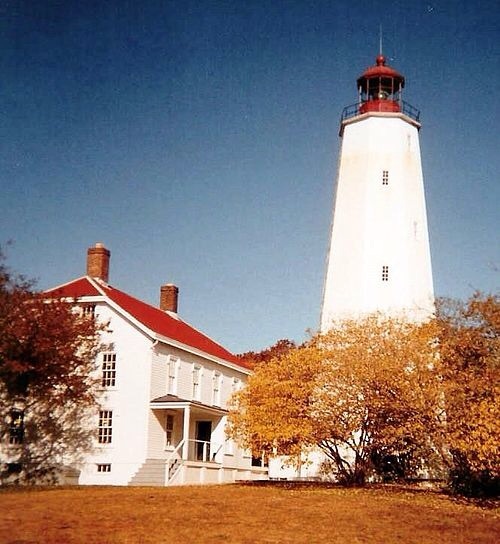 Sandy Hook Light — the oldest working lighthouse in the U.S. Built on June 11, 1764, at Sandy Hook, N.J., Sandy Hook Light is now located about one and one-half statute miles from the tip of Sandy Hook as a result of the natural occurrence of littoral drift. Its original location was only 500 feet from the tip. The natural accumulation of sand drifting in the same direction from the action of currents in the water added nearly one and a half miles of beach land. Oldest Working Lighthouse in the U.S.beach land to the tip of Sandy Hook. Originally called the New York Lighthouse because the funds to build it were derived from a lottery conducted by the New York Assembly, the light was needed to aid ships coming into New York Harbor. The conducting of lotteries was not an unusual means of raising funds for internal improvements in early America. When the Constitution was adopted and the United States of America came into existence, the State of New York conveyed the lighthouse and land to the Federal government. Other lighthouses were treated differently. Because of anti-Federalist sentiment limiting the powers of the federal government under the Constitution, the federal government agreed to pay only for lighthouses and their keepers as long as the States contributed and maintained the land on which the lighthouses were to be built. The same restraints that limited the federal financing of inland waterways also limited the financing of railways and lighthouses. This entry was posted in celery, Coast Guard and tagged Federal Government, lighthouses, New York, Sandy Hook Light, states on January 31, 2015 by Florida's Big Dig.